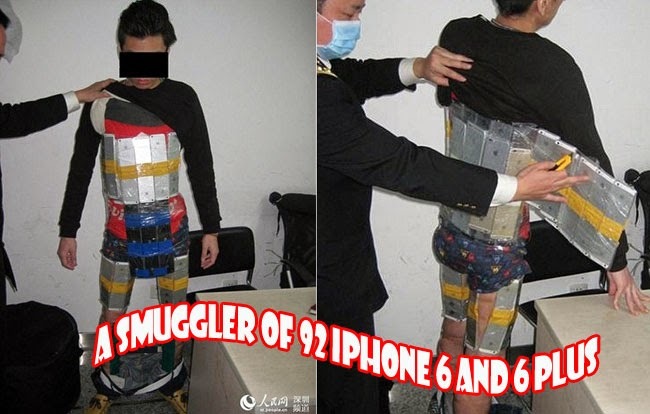 A Hong Kong citizen had been arrested after attempting to smuggle 92 iPhone 6 and 6 Plus by strapping the units on his body with packaging tape. Hoping that he will be able to pass to China with the said handsets, the man was caught after seen walking awkwardly. As reported by a Chinese news site, the man with the accompanying photos had strapped the iPhones on his chest, back and thighs, making him seem uncomfortable when walking. The iPhones were confiscated by the immigrant port, Futian Port, which is located between the mainland China and Hong Kong. Smuggling gadgets and smartphones had been very common in China where it tends to be more expensive due to taxes. Many foreign and local nationals had been hired to smuggle gadgets to evade high taxes and sell the gadgets and handsets with a cheaper price than those same models available in the market. It was said that the prices of the smartphones tend to quadruple after in had entered mainland China. On September 2014, there had been increased demands on iPhones in China yet the handset had been delayed in the stores making a large number of pre-orders in the Hong Kong online shopping sites.